This is the time of year when camellias, the workhorses of my winter garden, get their moment in the sun (so to speak). I haven’t always been a huge fan of camellias, but over the years one of my favorite gardening friends has successfully enlightened me. Thank heavens I’ve seen the light as I now have dozens of camellias in my garden. When its cold and bleak outside I’m so thankful for these bright spots of color. 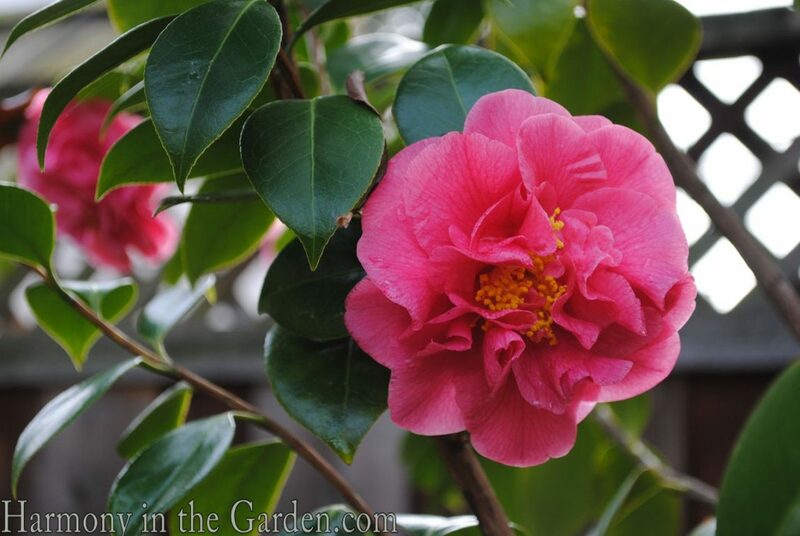 I have both types of camellias in my garden: the japonicas and sasanquas. What’s the difference? 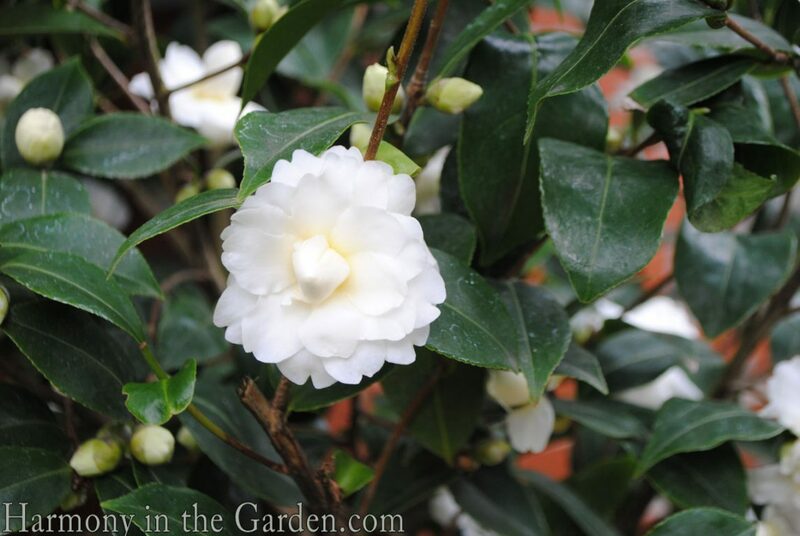 The japonicas are those camellias that grew in our grandmother’s garden – the biggies. They’re larger all the way around; larger in size with bigger leaves and bigger flowers. 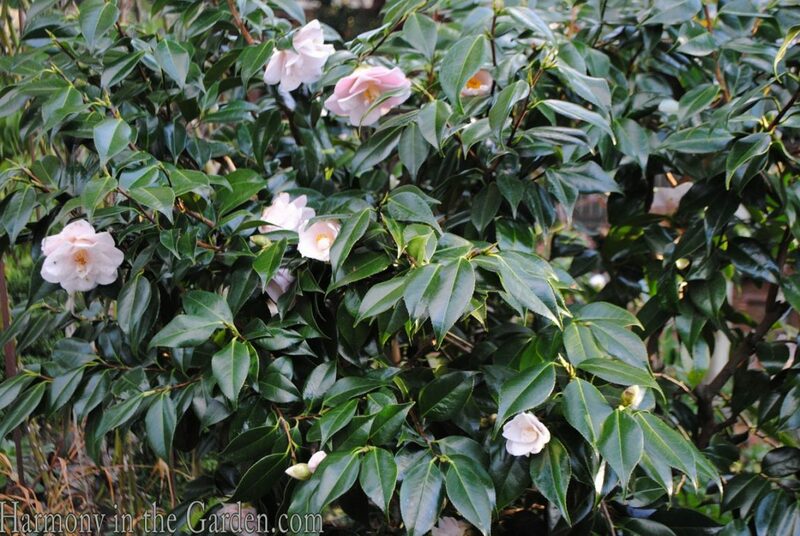 These camellias are happiest in shade and are great when you want a large winter-blooming evergreen shrub. Sasanquas, on the other hand, are smaller and more delicate than the japonicas. They have an open and airy appearance, with smaller leaves and smaller flowers. They can also handle more sun than the japonicas and tend to bloom in late autumn. Both varieties, however, need a few hours of sun in order to bloom. When someone tells me their camellias never bloom, the answer is almost always because it’s planted in too much shade. 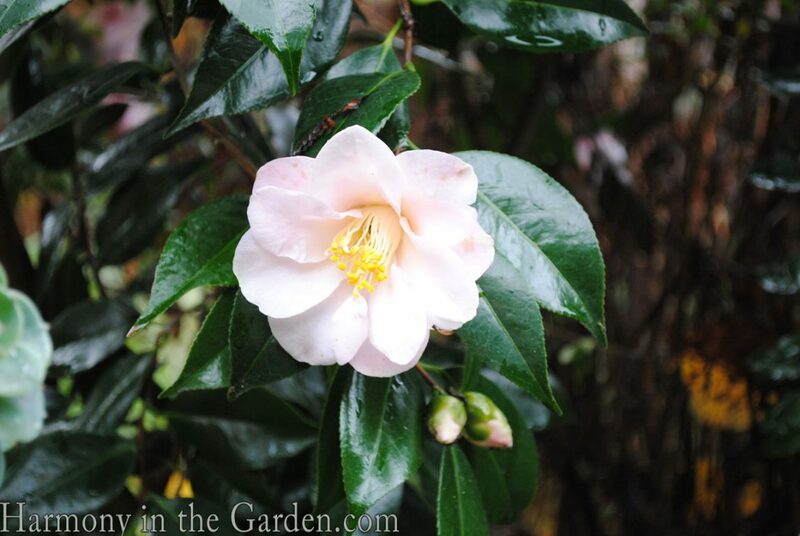 Camellia s. ‘Apple Blossom’ is the first camellia to begin blooming in my garden, starting as early as October. Each creamy white flower is edged in the palest pink and looks like – you guessed it – an apple blossom. Camellia s. ‘Buttermint’ is new to my garden and has quickly risen to the top of my favorites list. I’m smitten with its soft, buttery yellow blooms. The 2-inch double flowers are smaller, but the sheer number of blooms on this shrub make it a standout in my garden. It’s a smaller variety, 6’x4′, making it ideal for skinnier spaces. I typically don’t have a lot of red in my garden, but camellia s. ‘Yuletide’ is a welcome exception. Each December it’s reliably covered with cherry-red blooms, just in time for the holidays. 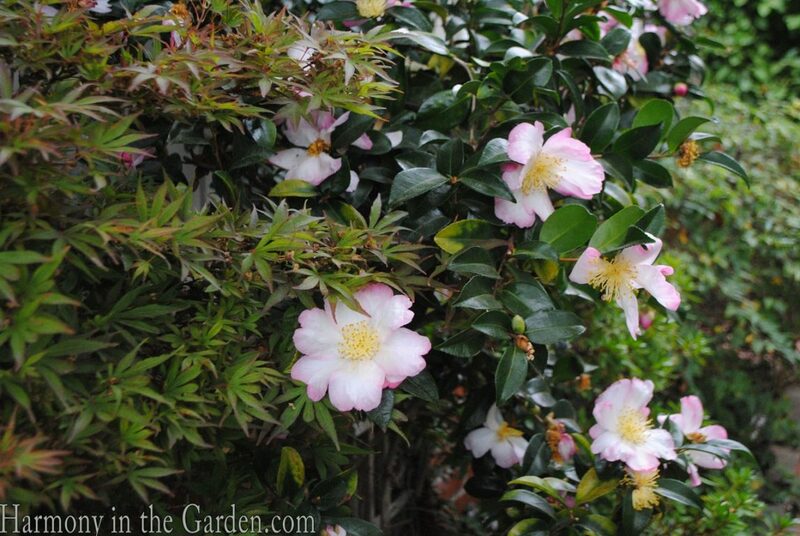 I include camellia s. ‘Setsugekka’ in more of my designs than any other variety. I always seem to have the perfect spot for it’s semi-double crisp white blooms. This variety is another early bloomer, starting in October, and signals the beginning of fall. 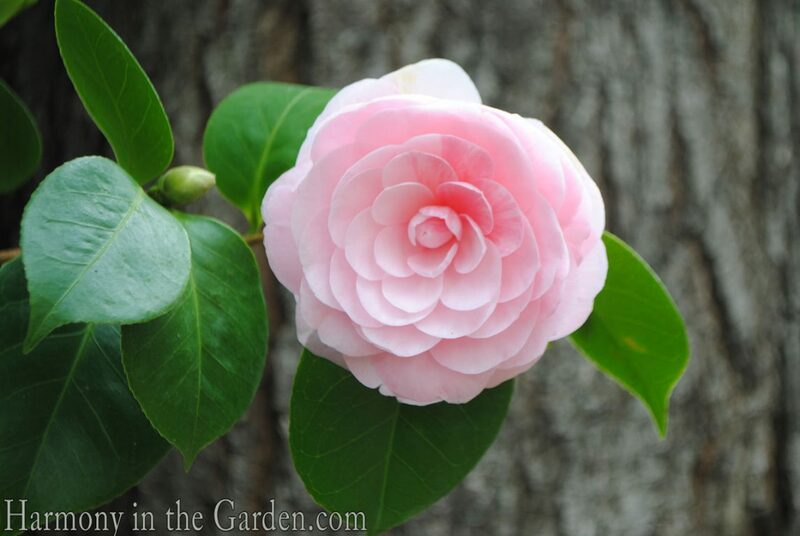 Just look at the symmetrical blooms of camellia j. ‘Pearl Maxwell’ – it doesn’t look real, does it? The soft, shell-pink blooms begin making their appearance in early spring and are truly a sight to behold. Another must-have is camellia j. ‘Scentsation‘, one of the few varieties that has a sweet fragrance. I like to float flowers in a shallow bowl of water to perfume my home. Don’t get me wrong – I love the earthy beet-like scent of other varieties, but sometimes it’s nice to have something sweet smelling in the garden. 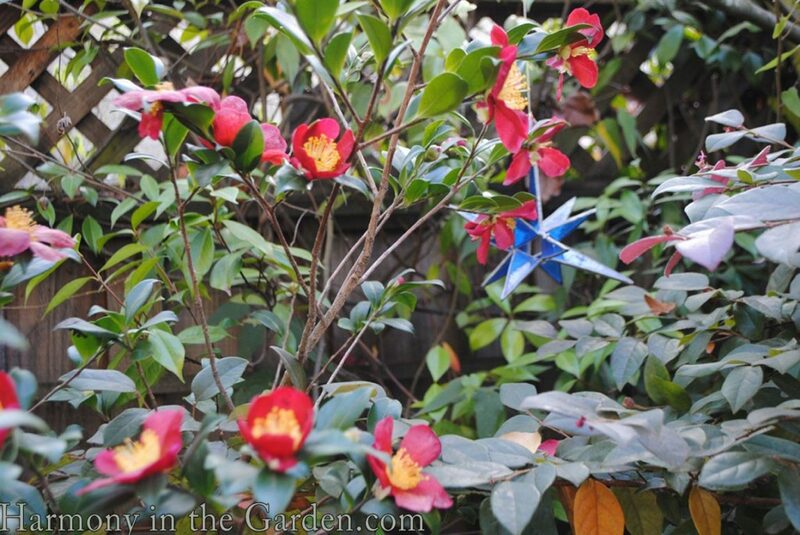 This upright growing shrub begins blooming in December, lasting well into February. 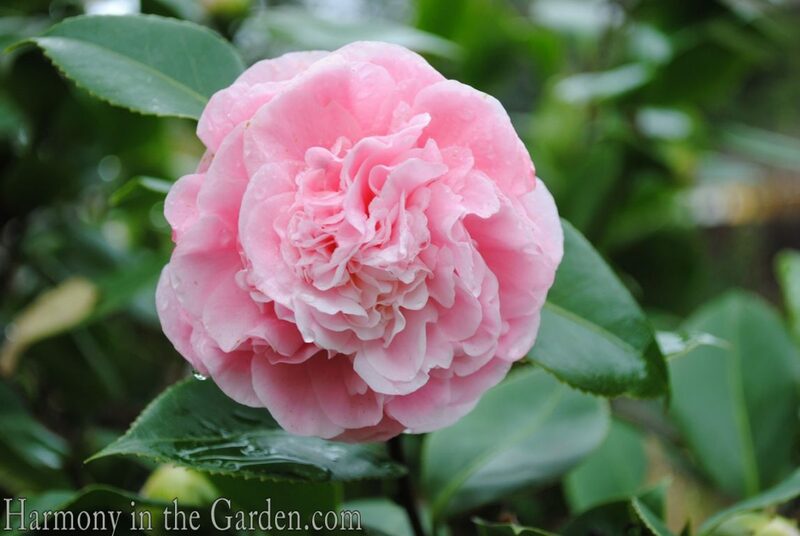 The soft, shell pink semi-double blooms of camellia j. ‘Magnoliaeflora’ are the epitome of elegant. This variety has some of the deepest, darkest green foliage in my garden and in certain lighting it seems to have a dark blue tinge to it. It’s amazing. The large, full blooms of camellia j. 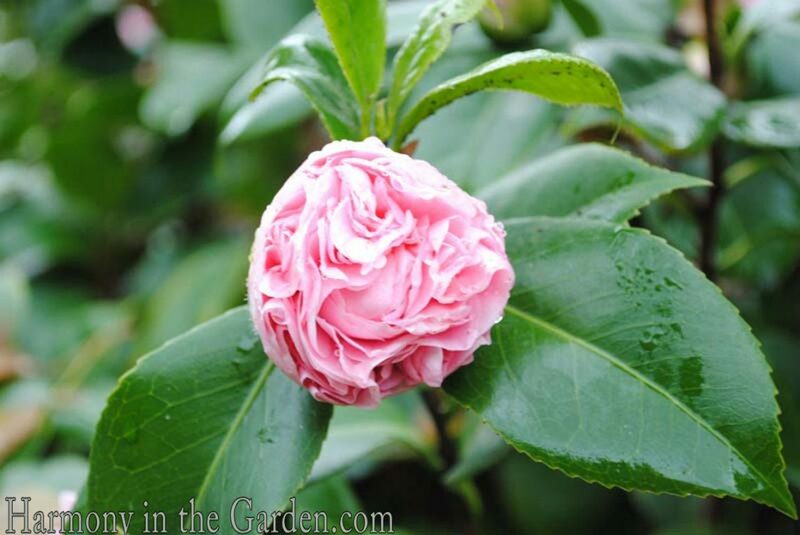 ‘Debutante’ always remind me of a peony – especially its tight, unfurling buds. This is a larger variety, growing to 8-feet tall and wide, and blooms in early winter. I have a few more spots to fill in my garden, so I’m curious – what are some of your favorites that you might recommend? So I moved to SF a couple of years ago and inherited a large overgrown open shade garden. I’ve spent the first year pulling most of the overgrown shrubbery out and cutting down a half dead tree or three and then I started researching for plants that might survive. My search took me to the SF annual Camellia show and I was sold — I bought 9 camellias on the spot and have added a tree form since (plus I had one in the garden already). The problem is that my garden is not that large and I also love hydrangeas and fuchsias and a lot of other beauties. 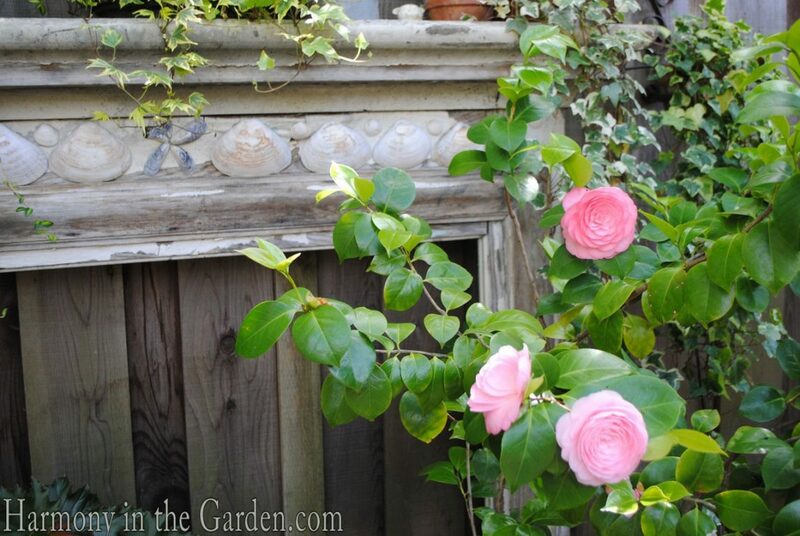 The solution has been to espalier several of my camellias on the fence. 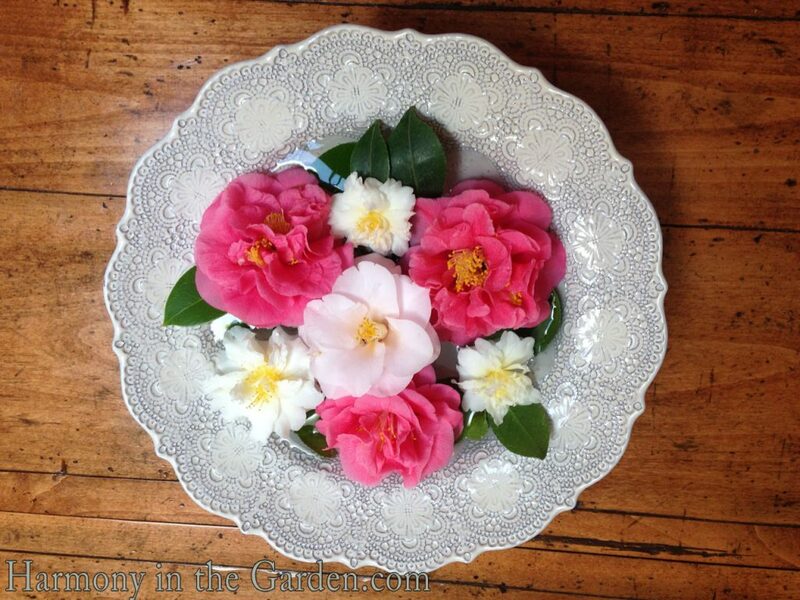 I did this with the one existing camellia I had and it has bloomed for 6 months now — amazing! My tree form Harold Paige is the most stunning shade of bright pink and I’ve got a couple of Nuccio’s. The smaller plants are in pots. Anyway, all this to say that there are ways of growing these plants even in smaller gardens. I’ve got 11 now and I’m thinking one more tree form to make an even dozen. Your scentsation is quite tempting! 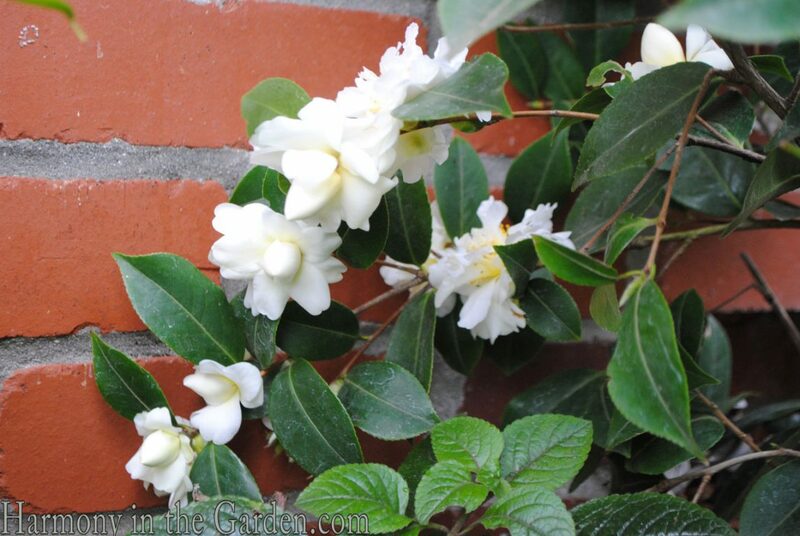 I’d love to see pictures of your camellias, Joan – they sound breathtaking! I’m so happy to hear you’re enjoying your new home here on the West Coast – a different world for you, no doubt. Yes – the Scentsation is fantastic variety. I have a bowl of its flowers in my house right now, perfuming my dining room. Thank you for your kind words, Nancy. And I envy you that you can visit Longwood Gardens whenever you like! I haven’t been, but it’s always been on my bucket list as one of the beautiful gardens I’d love to visit. Thanks for stopping by! 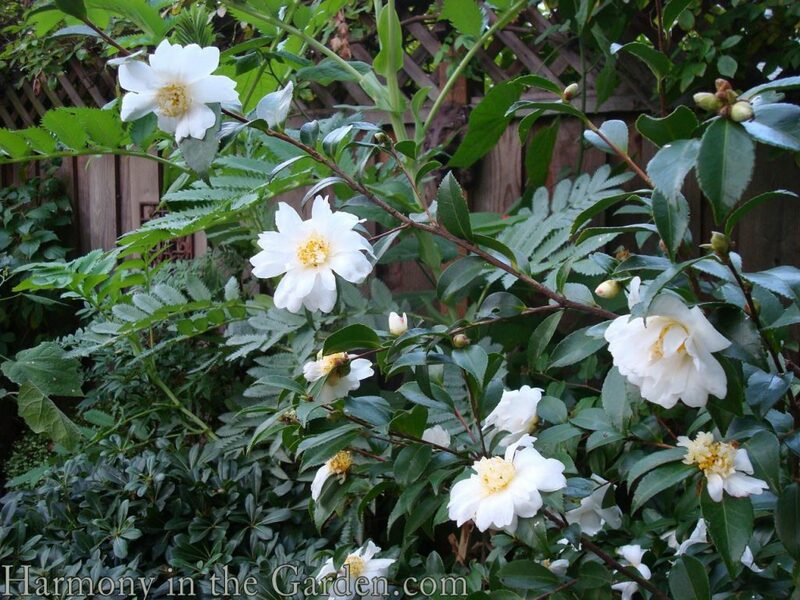 I miss the beautiful Camellias that dominated my former, shady garden. I do have a few here but not nearly enough. I must remedy that! Best wishes. Ah sweet Rebecca. Just catching up with you (which is never an easy job). Just after I read your posting I turned to my Mary Oliver morning poems and came to this, which reminded me of you. You’ve inspired me to add some camellias to my shade garden! Especially love Debutante! Hope you are feeling wel and nearing the end of your cancer journey. It’s been 7 years for me and I knw how nice it is when it’s all behind you! Take Care Rebecca! I so appreciate your words of encouragement, Donna. Thank you. And yes, I’m nearing the end of this whole mess with my last treatment tomorrow – hooray! I can’t believe it’s almost over (knock on wood). Yes, I came to appreciate camellias recently also. Planted two last year. Beautiful flowers this time of year! Thanks for sharing the great photos! Sabrina – which two did you plant? I’m sure they’re amazing varieties that I’ve never even heard of – ha! Hopefully I’ll be able to see them soon when they’re blooming! I’ve never even come close to a camillia. I’m from IL and now from CO. The beauty is evident. The scent is ??? Hi Sheila – well, if you like beets then you’ll love the scent of camellias. They’re so beautiful right now – I wish I could pick you a big bowl full to put in your home.